What are the Risks and Consequences of Drinking Alcohol? 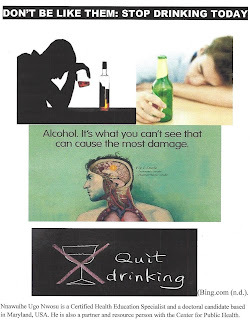 · Alcoholism causes vehicular injurie, fall accidents, drownings and burns. Courtesies: CDC, 2016) and Freeman, (n.d.). Stop drinking and save your life today! Nnawuihe Ugo Nwosu is a Certified Health Education Specialist and a doctoral candidate based in Maryland, USA. He is also a partner and resource person with Center for Public Health.